Its always been my goal (and dream) to eventually become a full-time YouTube creator for The Mind of Watercolor. Patreon is just one more avenue by which this may become a reality. I love how supportive all my viewers have been through their avid viewing and encouraging comments and its been even more humbling to see how many of you have asked how you can contribute further to my efforts. Patreon is a way in which I can now give my viewers that option but also a way I can be more interactive in the process. The Minder Patron community, I hope, will become a special community of participants who not only share my passion for watercolor painting but also want to grow with me and share a special place in their heart for this channel. Thanks for considering your participation and no matter how you support The Mind of Watercolor, you are appreciated. A blank sheet of watercolor paper waiting for paint can be an intimidating thing. In this video I suggest 5 steps to help get you over the anxiety hump and get those first strokes of paint down on the page with less stress. Watercolor loves great paper. You’ll improve your chances of getting good results by buying top quality paper from the beginning. Its a myth that beginners need to use cheap or student grade papers for practice. Use and practice with the best. Choose reputable name brands, 100% cotton, acid free, handmade or mould made papers and you can’t go wrong. Experienced artists will often paint on surfaces other than watercolor paper, but if you are a beginner, its best to stick with actual watercolor paper until you gain more confidence. Other surfaces can act more unpredictably. The Mind of Watercolor YouTube Channel has launched! Go check it out. I hope to create a community of watercolor enthusiasts where we learn more about this exciting and easy to use medium which also has a mind of its own and reputation for being unforgiving. I plan to share tips and techniques, review products, engage in challenges and perhaps have some contests and giveaways. It’ll be a blast. I’m a bit of a photo bug and I’ve also directed quite a few professional photo shoots in my design career, so I can’t help thinking about what it would be like to be a combat photographer. Imagine being given this assignment: “Hey bud, wanna stroll along with the guys going to Omaha beach and snap a few pics for posterity’s sake? Americans would love it, whadya say?” Ok, maybe the D-Day assignment wasn’t given exactly that way, but even so, after clearing the lump in my throat, I would probably ask if I could just hang around the ship and get some shots of the guys coming and going. Not Frank Capa. He was not only up for the assignment, he requested going with the first wave to hit the beach. I can hear the other GIs joking, “hey Frank, don’t ya know that camera shoots film not bullets.” He knew! He took 106 photos but due to a lab snafu only 11 survived; the only photographic record we have of that treacherous assault. Amazing! 10 of the 11 appeared in Life magazine. This ethereal shot has always been one of my favorites. The explosion in new, and sometimes awesomely cool, paper-crafting supplies got me to thinking recently. Manufacturers have apparently responded to a huge rise in interest with a steady stream of “cool stuff” for the paper-crafting big three – card making, scrapbooking and journaling; including new markers, inks, dyes, powders, mists, etc., etc. Any self respecting fine art painter (an area, I might add, where new things don’t come a long nearly as often) would be crazy not to occasionally cast a sideways glance at the craft market and say, “hmm, wonder what I could do with that in my painting?” Multimedia artists (some of which are also journalers) especially would seem to benefit. But wait, not so fast… or maybe I should say, not so LIGHT fast. Scrapbook and journaling suppliers in particular seem to have responded well to the archival needs involved. Acid free papers, adhesives and mediums abound but there is still a big gulf where fugitive colors are concerned. Paper crafters have the luxury of not needing to worry about this much. Exhibiting art and prolonged light exposure is likely low on their “caution” priority list. But with so many new alluring dye-based mediums surfacing, any artist hoping to hang or exhibit work needs to be very careful of the mediums they incorporate. Dye-base mediums are the absolute worst in terms of fugitive colors. Pigmented mediums in the craft market exist but there aren’t nearly so many as you might think. Many illustrators fluent in using Copic or Prismacolor markers are not new to the concern over dye-based mediums, even experienced studio and gallery artists may tell you first hand, its no fun to see your precious artwork vanish before your very eyes after hanging on a well-lit wall for a few years. Without doing a ton of research (for which I have no time), I thought maybe it better to just point you to some good reads where the work has already been done, by people who know where of they speak. Yeah, I’m just lazy that way. So, if your art will ever be displayed, read on and think carefully (think pigmented and archival) before you go including that cool new set of watercolor markers, powders or sprays in your next painting. One of my favorite re-enactment events in the Upstate, SC area is Festifall at Walnut Grove Plantation. To see more of this event I have a post with pictures here. Many of the photos I take at these events eventually become reference for paintings. 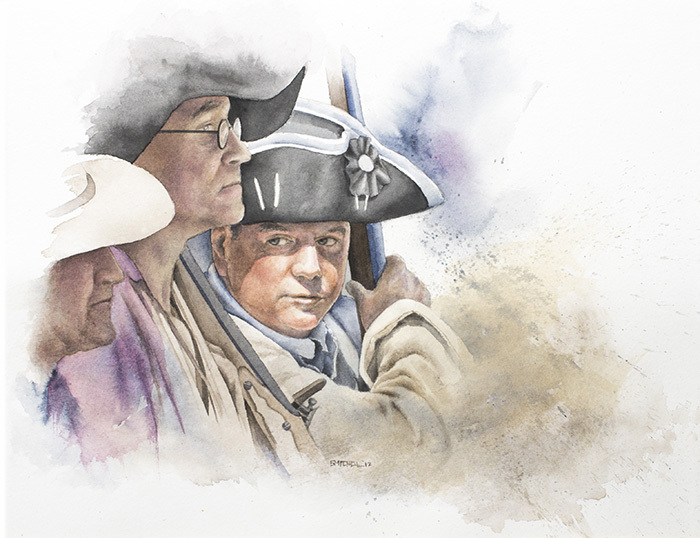 Here is one of my latest watercolor paintings entitled “The Muster” using reference from the Walnut Grove event. Enjoy.